Curiously, Samsung has introduced an induction Wi-Fi cooktop. In theory, you can connect your phone to the cooktop and monitor the burner settings as well as use time functions. Before we look at Wi-Fi, I want to see if this cooktop is competitive on features like output. In the video, you will see a very good cooktop with Wi-Fi. 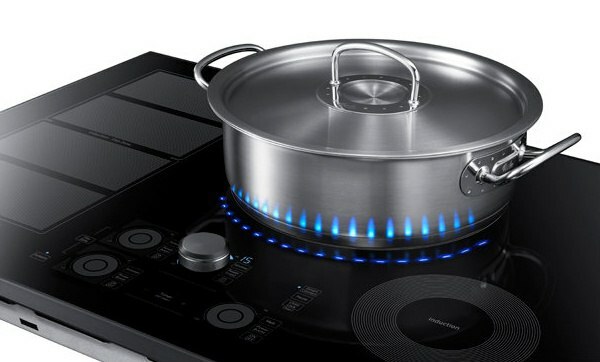 The connected house is becoming closer to a reality as Samsung now offers an induction cooktop with Wi-Fi capability. You can turn it on and off from your phone. Before we talk about the connectivity aspect let's look at the features of the unit. First, Samsung manufactures the unit in four burner 30-inch and 5 burner 36-inch sizes. It has decent output at 4,800 watts on their power burner. It's not as powerful as the Miele at 7,700 watts, but it is still better than the average brand at 3,600-3,800 watts. The side griddle burner allows for the use of larger and odd-shaped cookware. Samsung has what they call virtual flame technology in their induction. It is actually blue LED lights that simulate flame, so you will know when it's on. This is far more effective than other brand's smaller hot surface indicators, especially if you have kids. Now about the Wi-Fi: you probably will not leave food on your stove and cook it later, (you can if you want). However, you will never have to worry about whether you have left your cooktop on, because you can always monitor it from your phone. BTW, it also connects to the matching hood through Bluetooth, so when you turn on the cooktop, the hood will automatically start working. But is the Wi-Fi the reason to buy this cooktop? Probably not. However, it has a good configuration and better than average output. The blue LEDs make the product safer for your family and at $2,159, it is competitively priced with other brands like Bosch and KitchenAid. Looking for more information about induction products and the science behind induction? Download the Yale Induction Cooking Buying Guide with features, specs and inside buying tips on every induction cooktop and range from Wolf, Thermador, Frigidaire, Electrolux, Jenn-Air, Bosch and more. The Induction Guide has outputs and configurations of every induction cooktop and range on the market. Well over 200,000 people have read a Yale Guide.